Extremely clean and well kept! Great spot, close to town, and better than expected fishing under the lights at night. There are two different marinas for boat launch within 5 min of the house. The beds were comfortable and we enjoyed the shaded back deck. Will definitely be back! Great place, kids loved it, close to the beach. Loved it. Fabulous beach home. The management was great when it came to responding to any questions or needs. Our family thoroughly enjoyed our stay...comfortable and clean! We would go back again! An excellent experience. I cant find enough good things to say about our stay. We had 4 adults, and 4 kids, and had plenty of room for everyone. The teenagers enjoyed having their own floor with kitchen, and living area. House is very well taken care of, everything was in excellent working order, with features that make it an excellent environment for some beach stays. Outside shower was great to clean off the sand. 2nd floor balcony was great to enjoy some outdoor breakfasts, and drinks in the evening. I loved the 3rd floor to watch the lights at night. I wish I could say more good things about Trade Winds, but they communicated well before we got there, were on site to check on in, and made some excellent food recommendations as well. Their info packet was top notch, and we had no reason at all to contact them until it was check-out time. Thats what I was hoping to have, simply because it meant that theyve taken good care of the property, had everything you could want already there, and were on top of things. I would not hesitate to come back again, 3 minute walk to the beach, short drive into town, but I still felt like we had privacy. It was everything we had hoped it would be and then some. Better than advertised! Great location. Exceptionally clean. We would stay here again. Beautiful property in great location! This property is everything it is depicted as. New house, new complex, close to beach access road. Property manager Dale came by twice to help us with questions and was there within 5 mins of calling him. Great Place to stay! The house was clean and well furnished. Wonderful for an extended stay or just a weekend. Owners Response: Thank you for your kind words. Tradewinds is happy "Another Day in Paradise" met your families needs. We appreciate your feedback. Exceeded our expectations! My husband, 2 kids, and 5 of their friends stayed comfortably in this immaculate beach house for 3 nights. The kitchen was fully stocked with gourmet pans and tools and the bedrooms were super comfortable along with the bathrooms! My husband doesnt like the beach much but afterwards he said "I really enjoyed our stay this time at the beach"! The beach is right around the corner and very convenient to shops and restaurants. Highly recommended for a big group! Perfect home for family trip! The Naughty Monkey was more than we expected. The pictures make the space look a little narrow but the floor plan is very spacious. 2 full kitchens !!! That was a plus with the grandparents staying downstairs. We thought it would be an issue with the upstairs and downstairs not connecting indoors but we hardly noticed it. Great location and the home came with everything that we needed. Definitely booking this home for our next family trip. Owners Response: Thank you so much for the kind words. We are so happy you enjoyed your stay at the Naughty Monkey. Thanks for staying in a Tradewinds home. See you on your next Port A beach vacation. Very spacious. Clean. The Mermaid is a great house. All the comforts of home. The kitchen is well stocked with the exception of mixing bowls and casserole dishes. We cook a lot and only had one mixing bowl and one baking dish. Plenty parking and just across from the pool. Check-in and checkout was easy. We love Spencers Landing neighborhood. Mary and Dale are super friendly and helpful. We will be back!! The beach was the best it has ever been. The water was beautiful green and clear. Summer of 2017 Memories Made!! Great house close to everything. Id recommend this house for anyone...it had plenty of space for our group of 6. Everything is new and nice. Golf cart rental is right across the street. The internet was not working but the rental mgmt company came right over to try and fix it. We would come back for sure. Owners Response: Glad the home suited your needs. TWC came out an added a power booster to the home. It increased somewhat and then sent another technician to work on the box down the street. That has solved the problem. Thanks. Come back and see us. Fabulous family getaway! We absolutely had a blast staying at Pelicans Pool Party! Dale and Mary were both so accommodating and sweet! The pool was definitely the highlight of our stay! We will definitely be back! Really beautiful home and a wonderful layout! The only problem we had was the mosquitoes. They were ruthless. We would spray but they were experts at finding a way in. With that said, the home was very lovely and we thoroughly enjoyed our stay. Thank you for sharing. We loved the decor and it was pretty quiet. We had a public beach access within a decent distance. The house is absolutely perfect!! We had a girls weekend with 11 if us! The house was perfect, it had everything we needed and more. It was a 2 min drive to the beach. I would definitely recommend this place.. the host were amazing! Good. The property was great for the group we had. Was a little disappointed in the cleanliness of the floor upstairs. Looked to be clean, but I think it may have been just swept and not mopped. Bare feet and socks were dirty when walking across it. But everything else was clean and tidy. Enjoyed our stay!! Would recommend this property to others as far as convenience and size and parking. The property was beautiful. I brought my family of 5, my mother and my in-laws. We all stayed in the upstairs portion of the house and we really werent that cramped. (My 3 kids are 2, 3 and 9, so they didnt take up as much room as the adults.) The space was great, the 2 bathrooms were plenty big, and the bedrooms were nice. *If youre going to stay for 5 days like we did, with just as many people, bring youre own trash bags, laundry soap, and toilet paper. We chose to cook a lot while there, and this beach house had plenty of kitchen stuff available for us to use. A lot of time was spent on the deck and backyard patio and my kids loved It! They really enjoyed waiving at all of the boats drive by! My favorite feature though, was the fence separating the back yard from the dock, kudos on that safety feature. We really enjoyed our vacation there. Location was perfect, about half way to Rockport Harbor as well as Aransas Pass! The only disappointment was not finding the hammocks until our last day there. We saw the hooks on day 1, but just didnt discover the bags until cleaning out the pantry on our last day. Oh well, not a game changer. Wed love to go back one day. Perfect vacation destination! Oh my goodness!!! What a perfect place for our family vacation!!! The Surfing Cow is such a cute place to stay in Port A. Friendly cows greeting you when you walk in the door, coastal colors, large open spaces to gather, spacious bedrooms, and best of all ... your favorite Blue Bell ice cream in the freezer. EVERYTHING worked; EVERYTHING was clean; EVERYTHING was comfortable. We especially appreciated the hair dryer & hand mirror in the master bath, hand mixer in the kitchen & ironing board upstairs. The dining table was large enough for all of us to play our favorite domino game ( that lasted 2 days). Every morning the early birds in our group gathered on the covered patio out back to visit quietly while enjoying the sunrise & that first cup of coffee. The location was perfect for us ... just private enough to be away from the traffic but oh, so close to the beach, which is where we want to be in Port A! I think our 4 year old granddaughter said it well when she walked in the door, "This is sooo beautiful!! Mommy & Daddy will be sooo impressed!!!" And youll be impressed, too. For a group of 6-8 people, its the right place & the right price ... Dont miss the Surfing Cow!!! Clean and comfortable place. Great location and very nice management. Have stayed there twice. On our last stay we had so much fun we left two items behind. Mary and crew were so nice to deal with and mailed them back to us. Nice management makes it very nice to stay at this property. Great renovations, great location! 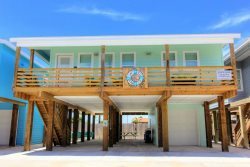 This property is REALLY close to everything Port A! One block from the beach road access and a few blocks from "Downtown". The inside is renovated and easily sleeps 10 people (including the fold out couch). Fenced in yard was a plus for our pup! Highly recommended. Very nice property, would definitely come back. Well furnished property in a great location. Everything worked well and the unit was very clean. Location, beautifully appointed, and spacious! Location, location, location. This condo was not only spacious but love the the updates!!! Ease of being on the 1st level was a plus. Being so near the beach and downtown made this condo a perfect fit for our family. Having the pool just steps away from the condo was right up our grandkids alley. I would recommend this condo to my friends and family. Cant wait to come back next year!!! Beautiful place to stay!! This house was wonderful!! We had a great time & plenty of room!! We will come back for sure. Kitchen is fully stocked. Definitely want to rent again. Great place to stay! Even though this house isnt right on the beach, it is close enough to everything you need by walking. Super nice having a pool in the back yard to swim in after long day of salt water! Great getaway at the Texas coast! My husband and I joined two other couples for a fabulous weekend at this clean, well-appointed Port A home. It was just a short walk to the beach over the beautiful dunes. We also enjoyed an entire afternoon at one of the two community pools, this one located across the street from the rental home. Very convenient to walk back and forth for extra provisions! The entire house is darling with a beach-theme throughout. I highly recommend for adult couples AND families with kids. A bunk room is great for children. Must drive into the town of Port A, but its only a mile or so away. Great restaurants and interesting shopping. Have fun!! Home was amazing! From day one this house was impressive. Such a quiet neighborhood. The pictures are great but the house is so much more. The house was clean, smelled clean, beds comfortable. The decor was cute and so suitable for the area. Such a great location to beach, pizza restaurant, grocery store and bars. Kids had a blast sharing a room. Parents enjoyed the patio and pool. Plenty of space for everyone. Restrooms spacious and clean. Lot of storage space. They had everything you need as far as kitchen and linens are concern. My family was excited about this find and we look forward to renting this space again. Thank you Mary it was a pleasure.